Molly started First Grade this year at Lakeview Design Center, the same school where I teach 4th Grade. I'm so thankful that we can go to school together each day! It is such a convenience and a great joy to see her throughout the school day at lunch or in the hallways. I do not take that privilege lightly! 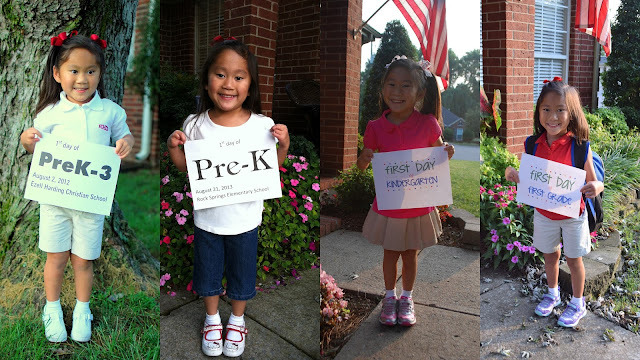 Here is a collage of the last 4 years of her school career! We did have a great summer, but she was anxious and excited for school to start! We wear uniforms to school, so picking clothes each morning is a breeze! I love the uniforms! It's basically a colored, solid colored shirt and navy, black, or khaki bottoms. She gets a new pair of tennis shoes each year and we're done! She loves dinosaurs...so we had to have the dino backpack and lunchbox for school this year! It is quite funny to see a little girl with bows in her hair walk down the hallway with a big dino backpack! Walking down the first grade hallway to find her new classroom! Ms. Cornelius is her First Grade teacher and we are so excited for a great year!! !